True, October is not high season in Budapest, but there are so many things to do, provided you are staying for more than one day in Budapest on your visit. And if you schedule your Budapest visit at the beginning of October, you can usually enjoy some sunny days. In contrast, the end of October can be windy and chilly. Besides visiting the baths of Budapest, or taking an October river cruise on the Danube, what are the best things to do in October? Probably one of the best programmes in October is a great festival on the grounds of the Buda Castle Royal Palace – wonderful site, fantastic foods and drinks plus live shows. Warmly recommended. Design Week, Budapest Art Market, Opera Contest & Fest, Hacktivity, Bonus Techno Festival, International Model Train Engineering Festival and more! A 3-day-long free event in Buda, with lots of concerts, children programs, “do it yourself stall” and of course lots of chimney cake stands and vendors. Palinka and Sausage Festival – two things the Hungarians love and usually take with themselves if abroad: palinka is an alcoholic drink and sausage needs no explanation. The Palinka and Sausage Festival is in October in chilly Budapest. Hungarian craft brewers unite to bring you home made flavours – what a pleasant thing to do in Budapest. Festivals in Budapest are great options for the weekend. October is when the new beers are introduced. Craft beers include several famous beer varieties made in Hungary, like the old Irish Red, the first Hungarian ’Belgian’ Beer, christened Friar Tuck, Buckwheat Lager, Bitter Honey beer, Black Sheep (a high-gravity pitch-black stout), etc. In October there are some Budapest parties in open air party venues in the city, but often parties move inside if the weather gets colder. Two special parties stand out from the usual Budapest nightlife events, which young visitors must do: the pool parties in Budapest baths, and the river boat parties on the Danube. October Bath Parties in Budapest bring amazing laser shows and bath discos in Szechenyi Bath for late night pool parties. Just get your swimwear and enjoy the night in this visual / tactile and all in all fun and sensual place. Budapest Halloween: what to do on Halloween / Halloween weekend in Budapest? Top 10 Ruin Bars in Budapest: if in doubt, take your own pub crawl in the ruin bars of Budapest, they are way cooler than what you would expect. Szecska Spa Parties are still not over in October, and will continue in Nov too: spa waters, music and party adding up as a ‘Sparty’. Definitely a must see and do for under 40 or so party goers who love techno discos and lots of folks. Enjoy a beautiful concert in Budapest: there are great classical and light music concerts, as well as live concerts in some bars and restaurants in downtown Budapest. Concerts in the Palace of Arts in Budapest: all October, many beautiful concerts await classical music fans in the leading concert hall in Budapest. Another excellent venue is the Liszt Academy Concert Center. The church concerts in Budapest are special with their unique atmosphere, and a nice cool air on warmer nights in September. Some of the outstanding foreign performers can be seen either in the Sports Arena in Budapest or in the Palace of Arts (MUPA). Hungarian Opera State House shows in October feature Carmina Burana, Bank Ban, Die Königin Von Saba, etc. 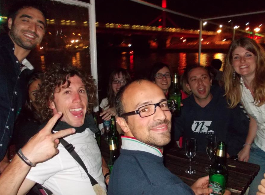 Show on the Danube: Some of the special October shows in Budapest include the Folk Dinner Cruise. World Press Photo exhibition is usually in autumn (end of September – all through October). The venue of the event may change, it can be the contemporary and industrial Millenaris Park complex, or recently in the historical Museum of Ethnography, just by the Hungarian Parliament. The World Press photos exhibited in Budapest are a selection of about 25 countries, picked by an international jury. As for many years traditionally, the World Press photo is a travelling exhibition, where the exhibition made of the award winning photos travels from country to country. You may recall that as a press photo show, most of the photographies are on the dark side, political turmoils, riots, hunger, abuse, etc. but there are some less stark photos of nature, sport, and life. Budapest Design Week is an excellent thing to see for those who love design and wish to visit Budapest in autumn. The design week is a regular event, often in September – October. Hugely popular! The Budapest Design Week has a multi-layered programme from exhibiting the works of designers in the Hungarian Design Awards, through fashion shows, tours given by art historians, presentations, conferences to inviting a star designer as a festival lecturer at the Moholy-Nagy University of Art and Design. The theme of the Budapest Design Week changes from year to year. Contemporary Art Festival – CAFe Budapest (former Budapest Autumn Festival). The Cafe Budapest Autumn Festival is full of less mainstream performances and concerts – in less mainstream venues, like the Budapest ruin pubs. If you like more experimental, alternative and quirky things, contemporary fine arts, modern classical music, free style jazz, etc. the Cafe Budapest Contemporary Art Festival is your thing to do in Budapest in October. Get spooky in Budapest during your Halloween holidays. Events are varied, festivals, parties, kids workshops, even a pool party are typically every year in Budapest. See our Halloween Budapest guide for more details, dates and venues. We have put together a short list of some of the best places to enjoy a Halloween party in Budapest, including smaller bars, ruin pubs, Halloween Boat Party and baths. A relatively new festival, first launched in 2014 with great success: home made pork sausages and pork wonders bring the true tastes of countryside Hungary to the capital city in a unique and quirky venue of the Train History Park of Budapest. While eating and tasting you can listen to local favourites in the folk, pop and rock genres. Budapest Model Trains Festival is a great place for model engineering and model railway fans, it is exactly the best you could wish for, if you love vintage vehicles of rails in a smaller size. True, the festival takes place off the city centre in Budapest in the Train History Park, but just take the time to get to the place to meet like minded railway fans. Budapest Marathon is held in October in Budapest is a runners’ must do sports event, and must be one of the most scenic marathons in the world. Its popularity is growing each year. Join the runners or cheer them up in October! 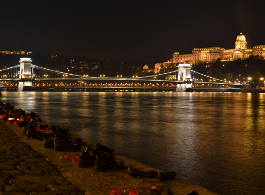 Run an AIMS certified marathon in Budapest, in the capital of Hungary! Distances: 42 km, unique 30 km, relay for 4 runners, minimarathon (7,5 km), fun run (3,5 km). More than 19 000 runners on the race day, over 4000 runners only on the marathon distance, about half of the marathon runners come from 60 countries, making the Budapest Marathon one of the most exciting and beautiful marathons in Europe. And there are even more festivals and great activities in Budapest in October. Check our Budapest October Festivals for a more comprehensive list, including the Jazzy Festival, Vampicon, Bonus Music Festival, Pet Expo, etc.